A majority of voters in 25 states and the District of Columbia said they disapprove of the president’s job performance. Trump retains support from a majority of voters in 16 states ranging from the Mountain States to the South. Fewer than nine months into President Donald Trump’s White House tenure, a Morning Consult survey in all 50 states indicates that voters have grown bearish on his performance in office. Trump has failed to improve his standing among the public anywhere — including the states he won handily as the Republican nominee during the 2016 presidential election, according to the online survey, which was based on interviews of 472,032 registered voters across each state and Washington, D.C., from Trump’s Jan. 20 inauguration to Sept. 26. The negative swings in net approval ranged from as high as 30 percentage points in solidly blue Illinois and New York to as low as 11 points in red Louisiana. But in many of the states Trump easily carried last year — such as Tennessee (-23 percentage points), Mississippi (-21 points), Kentucky (-20 points), Kansas (-19 points) and Indiana (-17 points) — voters have soured on the president in 2017. A majority of voters in 25 states and the District of Columbia said they disapproved of the president’s job performance in September, including those residing in Upper Midwest states with large Electoral College hauls that were critical to Trump’s victory over 2016 Democratic presidential nominee Hillary Clinton — and some of which are home to some of the most vulnerable Senate Democrats of the 2018 election cycle. Fifty-five percent of respondents in Michigan said they disapproved of Trump, as did 53 percent in Wisconsin and Iowa and 51 percent in Pennsylvania. Fifty-one percent of voters in Nevada and Arizona, where the Senate GOP’s most vulnerable members are up for re-election next year, also disapproved of Trump’s handling of the presidency. “It’s always hard, though not impossible, for the president’s party to maintain or even gain ground in an election,” Kyle Kondik, managing editor of Sabato’s Crystal Ball at the University of Virginia Center for Politics, said in a Sept. 21 interview. He cited solid approval numbers in recent years for former Presidents Bill Clinton in 1998 and George W. Bush in 2002, when their parties bucked midterm trends. But, Kondik said, those types of gains are made when the president has favorable numbers. In three other states Trump carried during the presidential election — Florida, Georgia and North Carolina — voters were practically split on his job performance, with an even or nearly even net rating. The president retained support from a majority of voters in 16 states in September, all of which he carried in 2016. Trump is most popular in Wyoming, where 60 percent of Cowboy State constituents said they approved of his job performance as of September, followed by West Virginia, where 59 percent of Mountain State voters approved. Trump’s approval in the Deep South is highest in Alabama, at 59 percent, while 57 percent of Louisianans, 54 percent of Arkansans, 53 percent of Tennesseans and 51 percent of South Carolinians are still in his corner. 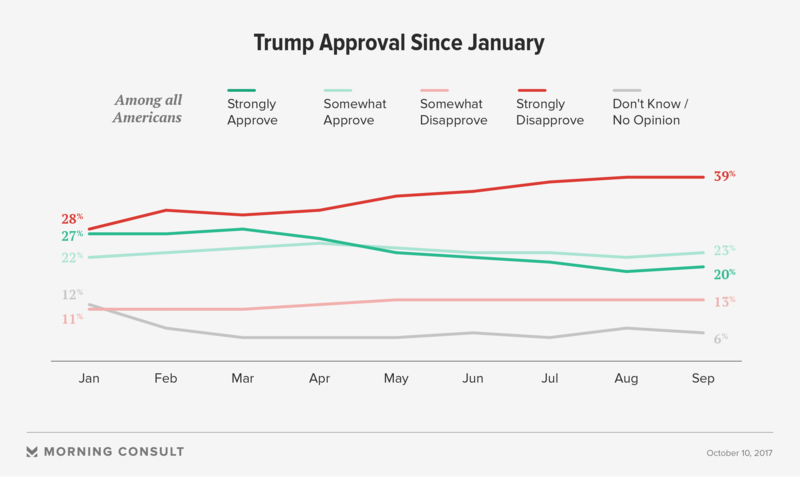 Looking at the bigger picture, Trump’s national net rating was down 19 points from January, when 49 percent of voters approved of him and 39 percent disapproved. In September, 43 percent of respondents approved of Trump while 52 percent disapproved. The president enjoyed a relative honeymoon period during his first three months in office, but the decline in his support was consistent into August before his numbers bounced back slightly in September amid bipartisan deals with top congressional Democrats on extending the debt ceiling and government funding. From April to August, the dips tracked with a number of controversies involving the investigation into whether any of Trump’s campaign associates colluded with Russia to influence the 2016 presidential election — particularly the circumstances surrounding his decision to fire then-Federal Bureau of Investigation Director James Comey in early May — and his reaction to the violent events in Charlottesville, Va. Congressional Republicans’ at-times chaotic and secretive efforts to overhaul the Affordable Care Act, former President Barack Obama’s signature 2010 health law, also correlated with a loss of confidence in the president. Democrats and independents accounted for much of the downward spiral: Trump’s net approval among Democrats is down 25 points (from -46 to -71) since taking office and he’s down 18 points among independents (from even to -18). Eighty-four percent of Democrats and 54 percent of independents said they disapproved of Trump as of September. Republican voters have also taken a dimmer view of Trump’s job performance as the months rolled on: His net approval rating among GOP voters has dropped 9 points, although 81 percent still backed him in September. Perhaps more concerning for Republican lawmakers on Capitol Hill ahead of the 2018 midterms — which typically serve as referendums on the presidency — is a growing enthusiasm gap among GOP voters and dissenting partisans. From January to September, the share of Republicans who strongly approve of Trump declined by 10 points, from 53 percent to 43 percent. Meanwhile, the intensity of disapproval among Democrats and independents has risen. Seventy-one percent of Democrats said they strongly disapproved of Trump in September, up 16 points from January, and among independents, there was an 11-point bump in strong disapproval, from 26 percent to 37 percent. Those figures may encourage the Democratic Party, which is hoping to harness that energy — and a lack thereof for Washington’s ruling party — to ride a wave similar to the one that gave Republicans control of the House in 2010 and the Senate in 2014. However, that risk is minimized in the Senate, where Democrats are defending 25 seats and Republicans are trying to hold just eight — and “even in the House, you have so few competitive races,” Rothenberg said. The more immediate problem for Trump, according to Rothenberg, is that his declining numbers will reduce his influence with Republicans on Capitol Hill, whom he’ll need to help secure legislative victories. “He wants to have clout, and to the extent that he is deemed to be a drag — an albatross — on Republicans running around the country, it just lessens his influence on the Hill,” he said. Use the table below to sort through Trump’s approval now and at the beginning of his term. Correction: A previous version of this story misstated the number of states where Trump retains a majority of support from voters. He has support from a majority in 16 states.